Girija Prasad Koirala 1925-2010 | United We Blog! Long live democracy in Nepal. Girija Pradad Koirala, one of the great democratic leaders of Nepal, has died. Minister for Irrigation Bal Krishna Khand told mediapersons after Nepali Congress Central Working Committee meeting that 86-year-old Koirala passed away at 12.10 p.m. Saturday. His body will be kept at the Dasharath Stadium, Tripureshwor between 8 a.m. and 2 p.m. Sunday, one of the CWC leaders Sher Bahadur Deuba said, Republica reports. 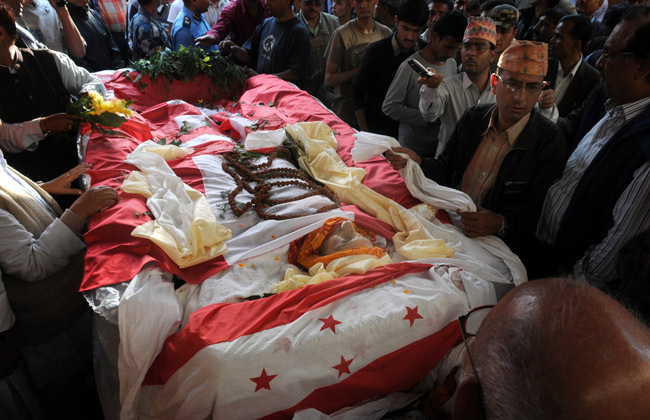 Until then, the body will be kept at his daughter and Deputy Prime Minister Sujata’s residence at Mandikhatar where Koirala breathed his last. The last rites would be performed on Sunday, Khand added. The four-time prime minister who has long suffered from chronic obstructive pulmonary disease had fallen unconscious since early morning today (at around 5), according to doctors attending Koirala. Koirala had suffered from diarrhea on yesterday night which furthermore deteriorated the health of the veteran leader. “He has been further weakened though his condition had improved after treatment [at Shahid Gangalal Hospital] last week,” Sitaula said about Koirala’s health on Friday (yesterday). sorry to hear the sad news..
may his departed soul rest peace in heaven…..
i am very sad on hearing the news. He was the right person to be awarded with NOBEL PRIZE 2010.
he is the father of Nepalese Plitics. May the great leader’s soul rest in peace! Girja babu’s death is a great loss for the country. His contribution to the peace process in irreplaceable. It seems official condolence site http://girijaprasadkoirala.com/guestbook/ . I am proud as I am from the country of GP Koirala. Certainly,its a sad news.Due to the demise of tallest leader in the Nepali politics,there would be multi-ranged impact in Nepali politics in the days to come.After overall evaluation of jobs carried out by late leader,there would certainly be negative and positive impacts in current political impasse out of the absence of GPK.Ultimately,a notable change seems very close to door resulting the departure of GPK.Jay Nepal ! It’s a good news. He made Sujata deputy prime minister at the end of his life. Is that his greatness? It’s time to celebrate. He will always be loved for his great contribution to the country they sent me sms from Nepal unexpectedly yesterday, I understand he was the greatest of all, in spite of his weak health and illness he kept contributing. May the spirit of his Contribution be honoured and Peace be restored to all, heartfelt condolences to his family and all his relatives of the extended family of nepalese. Beyond party politics. Please. GPK was no ‘great leader’. He was an intellectual lightweight who took advantage of his brother’s stature to project himself as ‘great’. History will judge his rule as being one of the most miserable. This committed ‘democrat’ destroyed democracy in his own party. Look at the NC today. It is a pathetic shell of its former self. Who is to blame? Mr. Girija Prasad Koirala. His brother was visionary, selfless, intelligent and a true martyr whereas GPK was small minded, completely without ethics and someone who only cared for what would happen to him and his immediate family. I am sorry a man has died but I think his death brings some hope to the country. GPK RIP – but have to agree with some fellow bloggers he always did things half arsed and half cooked – a clear sign that the man was reaching far beyond his grasp intellectually. As they say a little knowledge is a dangerous thing – apt to add and a dodo weilding much knowledge is far more dangerous. GPK was colourful, interesting and not half amusing – not unlike the circus clown – we loved them too. Unfortunately he had more serious a task at hand – so what could we expect? I am very sad when I heared this news , We didn’t loose just respected leader, we lost our prestige,our neplese identity. We express our deeply condolence to the Towering personality of Nepali Politics, The supreme Commander of people’s movement-2, Great leader of Democracy & Peace process of Nepal as well as Ex-Statesperson, Ex-Prime minister and Nepali congress (NC)president Mr.Girijaprasad Koirala. May his soul rest in peace in heaven…! GPK will be forgotton in a few months. Unfortunately he could have gone in the history books – but the maos ditched him and tried to make someone else Pres – now Yadav his dovtor will go into hisstory books while GPK will be mostly forgotton. Serves him right for putting himself and his ambitions before the nation.